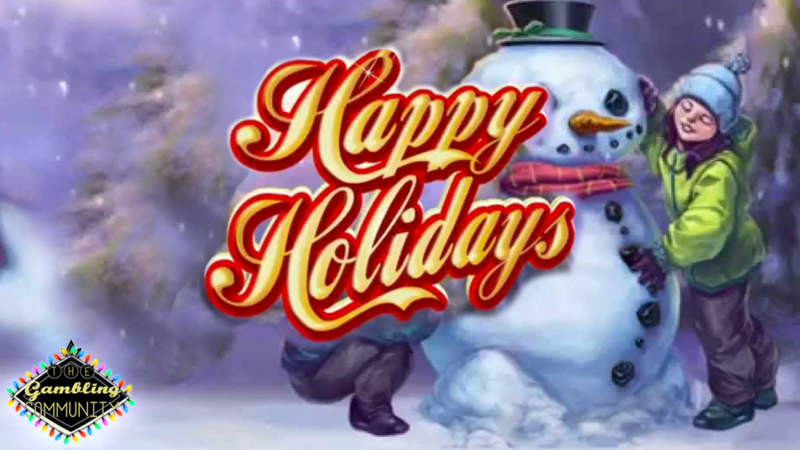 Today we’re going to look at Happy Holidays from Microgaming, this festive themed slot has a “hot” mode like Terminator 2 except its called “magic” mode, I have personally been lucky enough to get this a few years back and hopefully one of the members on here will get it this year, let’s jump into the TGC sleigh so I can show you what it’s like, the slot that is not the sleigh! 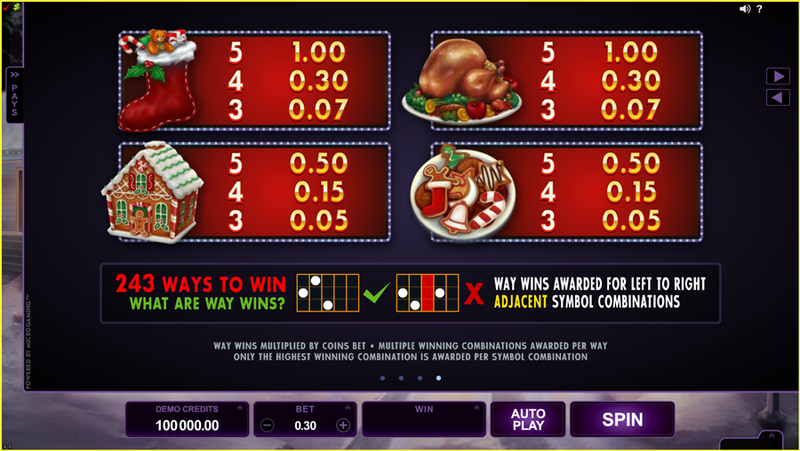 Happy Holidays has a 5 reel by 3 row layout with 243 ways to win, that simply means it pays all ways the same as DHV or Raging Rhino as examples. 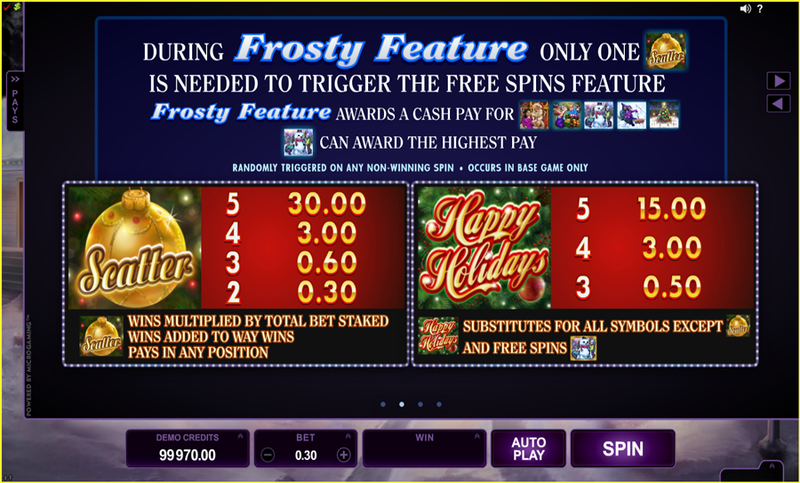 There is 1 main feature and 1 base game feature, the base game feature as shown below is called the Frosty Feature where the screen freezes over and you get a cash award for any of the top 5 premium symbols that are on the reel’s, you also get access to the main free spin feature with just 1 scatter anywhere on the reel’s! 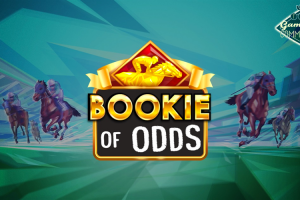 The main feature is the free spins which you get for landing at least 3 scatters or as mentioned above just 1 in the Frosty Feature. 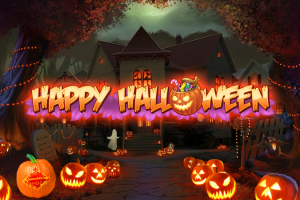 During these 10 free spins the reel’s expand to 4 rows giving you 1024 ways to win and as an extra the Snowman will transform to make the best combination of premium symbols for you every spin, there is also one hidden extra with this game, it’s called Magic Mode and its exactly the same as Hot Mode on Terminator 2 where the reel’s have substantially more premium symbols on and you’re guarenteed a decent bonus round, in fact take a look at my Magic Mode below, it paid 1357x stake! The max win is 2933x your stake on this game so I got less than 50% of it’s full potential, of course I was quite happy with that none the less! The paytable in Happy Holidays is dynamic and adjust with your stake in real time, The plate of Christmas biscuits and gingerbread house pay 1.66x each for a full way, the turkey and stocking pay 3.33x, now let’s take a look at the premiums. The lowest of the premiums is the Christmas tree which pay’s 6.66x, the children sledging pay’s 10x, the snowman pay’s 13.33x, the children unwrapping there presents pay’s 16.66x and Santa Clause pay’s 26.66x, these may not look a lot but bear in mind it’s a 243 way slot which means you can get huge multiples of any of these symbols, Iv seen 54 way’s of Santa Clause in 1 spin! The scatter symbol pay’s 1x for 2, 2x for 3, 20x for 4 and a decent 100x for 5, the wild symbol substitutes every symbol apart from the scatters and the snowman during the free spin feature, it also pay’s 50x for a full line offering a decent premium over the best symbol. Happy Holidays has an RTP of 96.62% and Id class it as the highest end of medium variance, it’s not quite high variance due to it’s max win potential of just under 3000x however if you get the Magic Mode feature you’ll sure feel like your playing a high variance slot with your win! The graphics and sounds are very Christmassy and personally I prefer this game to Terminator 2 regardless of the time of year, I just find that it pay’s better overall however they are technically the same game just with different skin’s but that’s my personal preference. 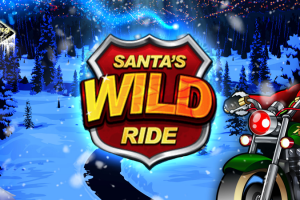 If you fancy a go there’s a link below to a TGC trusted casino and as always thanks for reading, ho ho ho!